Vol 1 | Issue 1 | July – Dec 2016 | Page 17-20 | Arun B Mullaji, Gautam M Shetty. Authors: Arun B Mullaji , Gautam M Shetty . Department of Orthopedic Surgery, Breach Candy Hospital & Mullaji Knee Clinic, Mumbai, India. Introduction: Computer navigation is now well known to improve limb and component alignment and reduce the number of outliers when compared to conventional techniques in total knee arthroplasty (TKA). The purpose of this article is to describe our technique of using navigation in revision TKAs. Computer navigation can be a very useful tool for the surgeon during revision TKAs and will help achieve precision in restoring mechanical alignment, joint line height and soft-tissue balance. Key Words: Computer navigation, revision total knee arthroplasty, mechanical alignment. Navigation allows the surgeon to accurately quantify limb alignment and component position during surgery and improve the overall precision of TKA. Computer navigation is now well known to improve limb and component alignment and reduce the number of outliers when compared to conventional techniques in total knee arthroplasty (TKA) [1-5]. Although several investigators have published reports on the accuracy and outcome of computer navigation in primary TKA, the literature is lacking on application of computer navigation in revision TKA. Computer navigation can also help improve limb and component alignment and reduce the number of outliers in revision TKAs similar to primary TKAs. 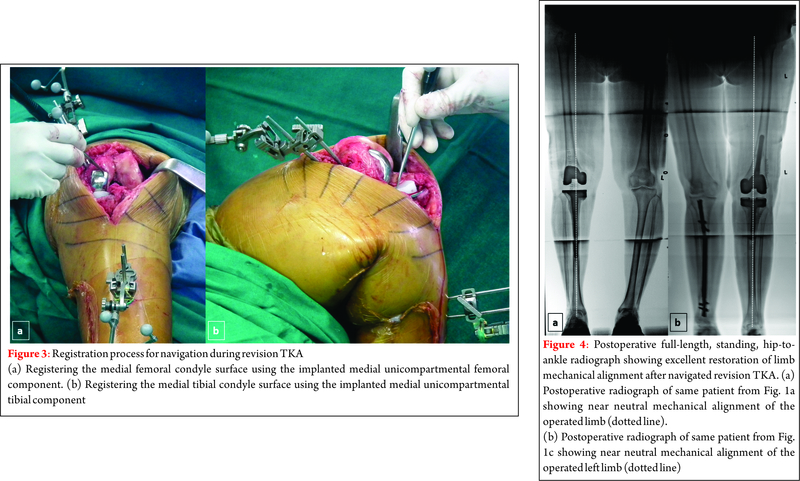 Confalonieri et al  in a matched-pair comparison of 22 computer assisted revisions TKAs (conversion of failed unicompartmental knee replacements to TKAs) with a similar group of revision TKAs performed conventionally reported fewer outliers and better joint line restoration in the navigation group. The use of computer navigation in revision TKA has specific indications. These include revision TKA done for limb malalignment, tibial or femoral component malalignment (coronal, sagittal or rotational), post-TKA soft-tissue instability, conversion of failed unicompartmental knee resurfacing (UKR) to TKA, and conversion of stage 1 to stage 2 in infected revisions (Fig. 1). The purpose of this article is to describe our technique of using navigation in revision TKAs. Preoperative planning for revision TKA using navigation includes obtaining and analysing preoperative knee (standing anteroposterior and lateral views) and full-length, standing, hip-to-ankle radiographs. The full-length radiograph will help the surgeon measure the amount of limb malalignment (as measured using the hip-knee-ankle or HKA angle), amount of femoral and tibial component malalignment in relation to their respective mechanical axes and degree of medio-lateral soft-tissue laxity as measured as the joint divergence angle (JDA) [7,8]. We used the imageless, infrared-based Ci navigation system with its software (Brainlab, Munich, Germany) for all our cases. The Ci navigation system involves infrared light emitted by a camera unit which is reflected back by a tracking array fixed to the tibia and femur. Both tracking arrays are fixed to the femoral and tibial bones using two 4-mm Schanz pins. The surgeon needs to carefully plan the position of array pins after taking into account the tentative position of intramedullary extension rods or wedges or cones which may be used later in the final implant. For the tibial array, we prefer fixing the pins away from the surgical wound, in the distal half of the tibial diaphysis so as to avoid interference of these pins during canal preparation and trial and implantation of long tibial stems. For the femoral array, the preferred site of fixation is either the distal one-third of femoral shaft or the metaphyseal flare of the distal femur taking care to avoid the femoral canal (Fig. 2). The old implant is kept in place for registration which is done in the standard fashion as described for the navigation system. The old implant acts as a surrogate for the proximal tibia and distal femur articular surfaces and allows the surgeon to register important articular landmarks. These include centre of the distal femur, centre of the proximal tibia, Whiteside’s line, anteroposterior direction of the tibial articular surface, articulating surface of the femur and the tibia (Fig. 3). After registration is complete, the computer software plots the initial mechanical axis and overall alignment of the lower limb. The surgeon can now measure the mechanical alignment/deformity at the knee in the coronal plane, correctibility of this deformity on applying a varus or valgus stress, and the amount of deformity in the sagittal plane (flexion or hyperextension). The surgeon can also determine the degree of femoral component malrotation intraoperatively and in conjunction with preoperative CT scans can revise and implant the femur in optimum rotation. Once the old implants are removed, the previous distal femur and proximal tibia cuts can be verified with navigation using a verification tool and the cuts can be revised if necessary. Cutting blocks for the tibial, distal femoral and anteroposterior femoral cuts can also be navigated in position to improve accuracy of the cuts. In extension, navigation also allows assessment of medial and lateral gaps and the limb alignment for a given spacer and also shows the degree of medio-lateral laxity present for a given spacer. The final alignment of the limb and gaps can be confirmed with trial components and again after implantation of the prosthesis especially when the cement is setting. Holding the limb in the appropriate position while the cement is setting is crucial to avoid malalignment of tibial and femoral components due to an uneven cement mantle or incomplete seating of the components. Navigation allows for real- time continuous visualisation of the limb position in both the coronal and sagittal plane while the cement is curing. Of the 224 revision TKAs performed by us from 2000-2016, 27 knees (12%) were revised using computer navigation. Indications for using navigation in these cases included component malalignment and loosening, limb malalignment, mediolateral soft-tissue instability, conversion of failed unicompartmental knee resurfacing (UKR) to TKA and conversion of stage 1 to stage 2 in infected revision TKAs. We could achieve excellent limb and component alignment in all of our cases of revision TKAs with the use of navigation (Fig. 4). The technique of revision TKA is complex and possess many challenges for the surgeon including indefinable bony landmarks, change in joint line height, bone loss, and soft-tissue imbalance. Computer navigation with it software helps the surgeon to achieve accurate limb mechanical alignment, component position and joint line height during revision TKA [6, 9, 10]. Although Massin et al  in a retrospective comparison of 19 navigated revision TKAs with 10 conventional revision TKAs reported no difference in outlier rates between the two groups, they found that navigation help them control joint line height better. Similarly, Jenny and Diesinger  in a retrospective study reported that navigation helps achieve significant improvement in component placement with 62% of navigated revision TKAs showing optimal implantation versus 39% in the conventional revision TKA group. The surgeon needs to take several precautions while using computer navigation for revision TKA. First, most computer navigation software currently available is designed for use in primary TKA. Hence the surgeon needs to use caution while using such software and needs to be well versed with it. Second, bony landmarks in a knee which is undergoing revision TKA are not well defined or clear. Hence the surgeon also needs to use traditional methods such as identifying and marking epicondyles using a marker and measuring the joint line position using a measuring scale along with computer navigation. Lastly, the pins used for fixation of arrays may have to be removed prematurely in some cases because of loosening due to poor bone quality or due to interference in canal reaming or trialling with long femoral or tibial stems. Hence, conventional instruments for revision needs to be kept ready. The indications for use of navigation in revision TKA includes limb malalignment, tibial or femoral component malalignment (coronal, sagittal or rotational), post-TKA soft-tissue instability, conversion of failed unicompartmental knee resurfacing (UKR) to TKA and conversion of stage 1 to stage 2 in infected revisions. Computer navigation can be a very useful tool for the surgeon during revision TKAs and can help achieve precision in restoring mechanical alignment, joint line height and soft-tissue balance. However, the surgeon must be well versed with the use of computer navigation in primary TKAs before embarking on computer assisted revision TKAs. 1. van der List JP, Chawla H, Joskowicz L, Pearle AD. Current state of computer navigation and robotics in unicompartmental and total knee arthroplasty: a systematic review with meta-analysis. Knee Surg Sports Traumatol Arthrosc. 2016 Nov;24(11):3482-3495. 3. MacDessi SJ, Jang B, Harris IA, Wheatley E, Bryant C, Chen DB. A comparison of alignment using patient specific guides, computer navigation and conventional instrumentation in total knee arthroplasty. Knee. 2014 Mar;21(2):406-409. 4. Huang TW, Hsu WH, Peng KT, Hsu RW, Weng YJ, Shen WJ. Total knee arthroplasty with use of computer-assisted navigation compared with conventional guiding systems in the same patient: radiographic results in Asian patients. J Bone Joint Surg Am. 2011 Jul 6;93(13): 1197-1202. 5. Mullaji A, Kanna R, Marawar S, Kohli A, Sharma A. Comparison of limb and component alignment using computer-assisted navigation versus image intensifier-guided conventional total knee arthroplasty: a prospective, randomized, single-surgeon study of 467 knees. J Arthroplasty. 2007 Oct;22(7):953-959. 6. Confalonieri N, Manzotti A, Chemello C, Cerveri P. Computer-assisted revision of failed unicompartmental knee arthroplasty. Orthopedics. 2010 Oct;33(10 Suppl):52-57. 7. Mullaji AB, Shetty GM. Preoperative Planning. In: Mullaji AB, Shetty GM, eds. 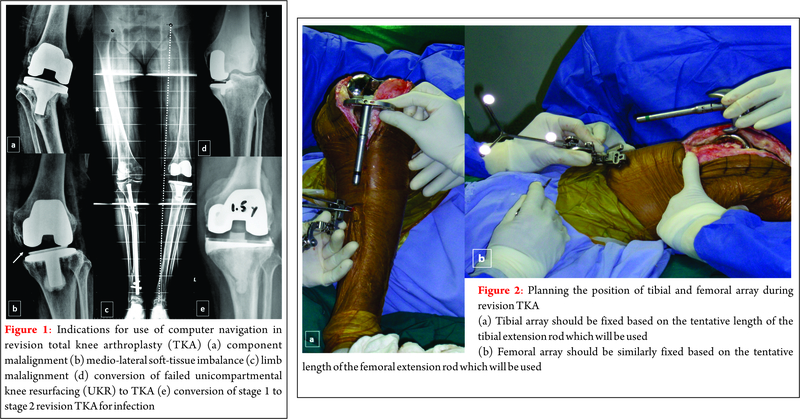 Deformity Correction in Total Knee Arthroplasty New York: Springer, 2014:5–9. 8. Mullaji AB, Shetty GM, Lingaraju AP, Bhayde S. Which factors increase risk of malalignment of the hip-knee-ankle axis in TKA? Clin Orthop Relat Res.2013;471:134–141. 9. Massin P, Boyer P, Pernin J, Jeanrot C. Navigated revision knee arthroplasty using a system designed for primary surgery. Comput Aided Surg. 2008 Jul;13(4):179-187. 10. Jenny JY, Diesinger Y. Navigated revision TKR: a comparative study with conventional instruments. Orthopedics. 2010 Oct;33(10 Suppl) :58-61. How to Cite this article: Mullaji A, Shetty GM. The Technique of Computer Navigation in Revision Total Knee Arthroplasty. Journal of Clinical Orthopaedics July – Dec 2016; 1(1):17-20.